Each of these permutations produces unique narrative responses that are the result of a series of subtle differences in player choice. For instance, if the player attacks Navarre first, then Alex Jacobson (an intel officer of UNATCO) immediately expresses his horror over the intercom. Whereas, if Navarre attempts to murder the player first (for disobeying her command) then Jacobson expresses his support for JC instead. Such differences constitute the first type of consequence In Deus Ex: these are primarily cosmetic and designed to make each permutation feel unique for the player. However, such repercussions actually produce no significant changes in the dynamic narrative: whether the player murders Navarre first or the other way around, there are no differing consequences beyond Alex’s commentary. However, the second type of consequences actually feed back into the dynamic narrative, significantly affecting events that occur later in the game. [Please refer to figure 5.3] I have provided a simplified representation of the narrative structure in Deus Ex. Note that if Navarre lives, she returns throughout in later portions of the game until the player reaches a non-negotiable confrontation with her. If Navarre dies, these subsequent portions of the game occur without her. 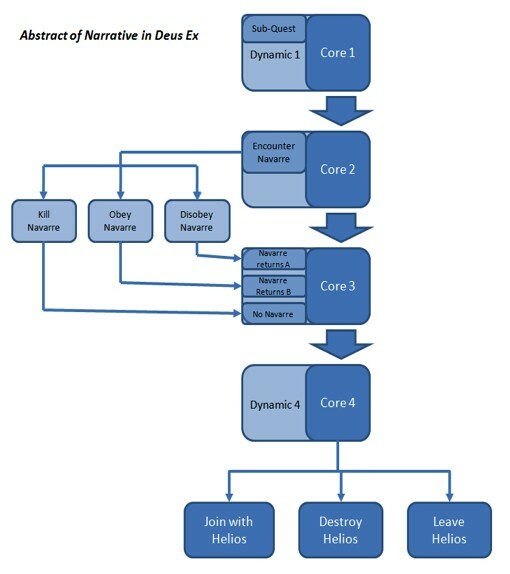 [Figure 5.3] An abstract of narrative structure in Deus Ex. Let us compare this to the linear dynamic present in Half-life 2. There are definitely similarities: ‘core narrative’ events are often progressed by successfully achieving puzzle or combat objectives. However, the dynamic narrative in Deus Ex provides a constantly shifting context for the events of the core. This allows the diegetic experience to differ from player to player while maintaining a consistent narrative trajectory. Be that as it may, do these choices really constitute 'gameplay'? They are hosted and calculated in the game-engine, this cannot be denied, but the nature of these decisions is fundamentally different to traditional play: there is no lose scenario. Available decisions in Deus Ex can sometimes be classified with binaries such as aggressive or defensive, pragmatic or idealistic, but never success or failure. Even if JC Denton was played as an indiscriminate sociopath, attempting to kill friends and enemies alike, this would not ‘fail’ the player by default; it would be the overwhelming military response that created a game-over scenario. Regardless, dynamic narrative and choices it entails is not constructed, ontologically speaking, to allow for binary states of success of failure. Does this confirm a fundamental incongruity between diegetic and ludic experience? Even if certain dialogue options resulted in instant player death, how could this constitute failure or success in narrative terms? How can one ‘fail’ a narrative? Some ludologists have attempted to incorporate this dynamic into their theories by distinguishing between forms of 'play'. For example, Gonzalo Frasca draws upon the work of French theorist Roger Caillois in his essay 'Simulation Versus Narrative'. Caillois's theories surrounding the nature of play have become increasingly influential in ludological discourse because he distinguishes between different modes of play. Frasca isolates two of these modes: paidia and ludus. Paidia refers to 'the form of play present in early children (construction kits, games of make-believe, kinetic play) while ludus represents games with social rules (chess soccer, poker)' (Frasca 229). The critical difference he identifies is that 'ludus provides us with two possible endings: winning or losing', whereas paidia is designed to excite pleasure through the plethora of possible outcomes. Games with no narrative content such as SimCity and The Sims Frasca clearly identifies as paidia, which seems appropriate to open-ended simulator-games. However, it is here that the age of Frasca's criticism begins to show: he states that 'Ludus is the simulational structure of choice for modernist simauthors: these designers have moral certitudes (Mario is good, the monsters are bad). Clearly defined goals do not generally leave much room for doubts nor for contesting that particular objective. Not suprisingly, all military games are ludus because they do not admit options that break its binary logic' (Frasca 231). How can we apply such an analysis to Deus Ex? Undoubtedly a 'military game', it features ludus through its combat system (there are rules, players can lose), but surely the dynamic narrative can only be categorised as paidia: this system contains no 'moral certitudes', or objectively desirable states of being. This is best exemplified by the final set of choices players must make in Deus Ex. The final level consists of JC attempting to stop Bob Page (the leader of Majestic 12) from merging with a sentient A.I called Helios in order to seize control of a global communications hub. When playing the final encounter, players must decide between three different solutions provided by the game's opposing factions. Tracer Tong, a member of the resistance, suggests that JC destroys both Page and Helios, essentially reducing the world to another dark age that requires devolved forms of government on a 'scale people can understand' (Deus Ex). Morgan Everett, former illuminati leader, suggests that JC kills Page, but preserves Helios and the global communications hub to reinstate the illuminati and rule the world from the shadows. Finally, Helios itself offers JC the opportunity to merge with it and thereby run the world using its nearly infinite knowledge and reason, thereby removing human folly from human government. None of these permutations are ethically preferable to the other: each presents the opportunity for further chaos and subjugation. Is the term paidia sufficient to describe such a system ? The three potential conclusions of Deus Ex, much like the rest of its dynamic narrative structure, are ultimately finite. There is no room for childish make-believe here, just a set of choices picked from a predetermined list. The restriction of player choice is dictated by the formal limitations of videogames; this is a technical horizon, not a theoretical one. Every alternative must be written in code, every repercussion dynamically linked to further choices. Perhaps the greatest flaw ludologists have identified in narrative theory regarding videogames is a persistent misunderstanding of the medium's formal structures. The optimistic theories which literary academics have often projected onto this new medium engages the dialectic register of dreams and endless possibilities: this language is appropriate for interpretive mediums such as poetry or novels, but is this the language of games? Configurative structures are always destined to highlight their own limitations: when dynamic elements oscillate within a finite set of possibilities, the boundaries that circumscribe this process are brought into focus. It's not about being unrealistic and demanding each choice I make creating another divergent path until the game looks like a fractal, coded by ten million people over a thousand years. It's about not only creating the illusion that my path through the pre-determined narrative is unique, but flavouring that narrative with the consequences of my actions (Walker 1-6).